Once upon a time my dad had a corduroy jacket. He bought it when he was stationed in Germany in 1967. It was a dark navy blue, with a mandarin collar, and while not too fitted, it was slim fitting. It had front pockets at hips level and it was lined. At one time, my mom appropriated it from him. Then I wore it all the time in high school and then my sister wore it too. It was worn to shreds. I loved that jacket. I would like to recreate it. 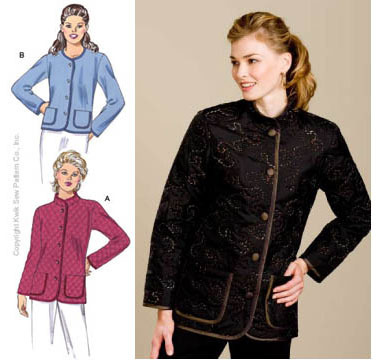 The last year and a half, I have looked off and on for a pattern that fit the style details of this jacket but have been fruitless in my searches. First I looked at images on Google images to find something that looked similar. Never found it. Then I looked at men’s patterns in all the usual places, the big pattern companies, Simplicity, and New Look. Couldn’t find anything that worked. I even called upon the esteemed Peter. I thought, “Surely he must have a pattern that fits the bill in his stash.” Actually, it is Peter’s most recent project, the cranberry corduroy suit, that reminded me of my dad’s jacket. Although Peter had some good ideas how to work around a regular blazer pattern, he did not have a pattern with that mandarin collar I so craved. And then I remembered Kwik Sew. The Kwik Sew of the famed Xmas pj’s I made last year. So I took a gander at both their men’s and women’s jackets. And lo and behold, there it was. THE. PATTERN. Enter Kwik Sew 3438 my friends. It’s not fitted, yet is still slim fitting. It’s simple, has the mandarin collar. My father’s jacket didn’t have rounded jacket corners, but that’s an easy fix. The pockets had flaps and I think were on the interior, not patch, but again, a simple enough change. Obviously, I won’t be binding the edges, but I think this may be it!!! It really closely resembles the jacket in my memory. Right, Mom??? Question of the day: Do any of you have clothing from your past that you miss and want to recreate some day? This is one of those projects for me. Tell me about yours! This entry was posted in Coats, Copying RTW, Kwik Sew, Question of the Day, Sewing. Bookmark the permalink. Weird, I am working on a corduroy jacket right now. That ks pattern looks nice. Ks patterns always look better than the cover art would suggest, in my experience. That pattern is a classic I’ve had for years. Actually, mine’s a Burda. Makes sense, no :-)? Once I had this little pink dress, with a white apron attached, with some lace too. I even had a little purse attached to it. I don’t think I have ever loved a garment more than I love that one. Great that you found a pattern to remake that beloved jacket. I look forward to seeing the result! I think the jacket could end up looking really nice and if it evokes good memories of your dad and you when you were younger, then that’s special too. How great that you were able to find something that fit the bill. Before I read all the way through, I was going to suggest Kwik Sew. Excellent patterns and wonderful instructions! Just have never been able to figure out the disconnect between their “art” in the catalog (photos) and the finished garments that other sewers produce. Unfortunate fabric choices? Who knows? I always recommend them to anyone looking for great, basic patterns. I keep thinking with affection of the salmon pink pants suit my mum made me when I was a young girl – how I loved it. But I don’t think that I will be recreating it – I don’t think I could carry it off now. Your corduroy jacket sounds like it’s going to be definitely worth recreating though! What a lovely post! 🙂 I’m very happy you found the pattern for the jacket. It’s nice to have items like that in your closet. I had a nightshirt when I was little that looked like a jersey. It was blue with a broad white stripe on each arm and a giant ’76’ on the front. I loved it.